Latest quirky celebration from Mexican right-back. 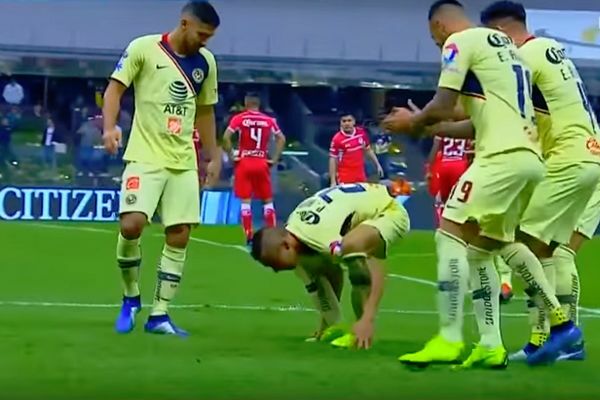 Club América right-back Paul Aguilar celebrated his goal in Monday’s 3-2 win over Toluca by holding onto his feet and bouncing around in a circle. Known for his quirky goal celebrations, Aguilar marked his latest strike with a routine that’s already prompted calls for it to be introduced to FIFA 19. His goal proved to be the winner in the Mexican side’s Apertura quarter-finals second leg triumph, clinching a 5-4 victory on aggregate. The first leg of their semi-final against Pumas UNAM takes place on Thursday, followed swiftly by the return fixture on Sunday. Their matches against Pumas are known as the Clasico Capitalino, with both teams based in the nation’s capital city. Managed by former Mexico international defender Miguel Herrera, Club América lie 2nd in the Liga MX after seventeen games. As things stand, Cruz Azul are three points clear at the top of the table.